Hamble Winter Series : 35th Hamble Winter Series - Week 2, Hamble Big Boat Championship & Hamble One Design Championships - Week 1. 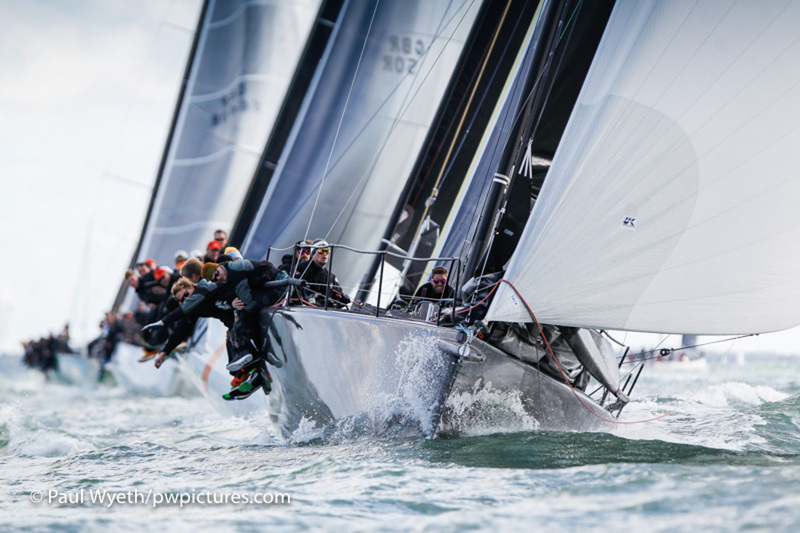 35th Hamble Winter Series - Week 2, Hamble Big Boat Championship & Hamble One Design Championships - Week 1. 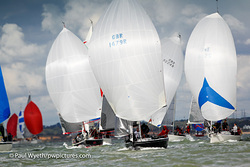 In IRC 1, Roger Bowden's Nifty had a cracking day on the water, adding another two firsts to their so-far perfect score. 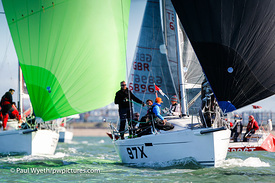 Dusty P, Richard Patrick's First 40 scored two seconds in their first time out this series, while James Wilkie's Reflex 38 Fast Tack Puma and Philip Farrands' Humphreys 40 Old Mother Gun took a third place apiece. 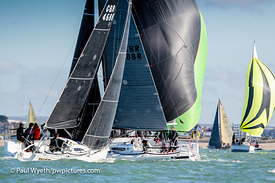 IRC 2 saw Simon Perry's J/109 Jiraffe and Mike Bridges' Elan 37 Elaine take a first and a second apiece, leaving them only a point apart overall. Mike Moxley's Malice put in a solid and consistent performance, adding two third places to their scoreline. In IRC 3, Robin Stevenson's Upstart added two bullets to their score, taking them comfortably clear at the top overall. Scarlet Jester, Jamie Muir's SJ320 took a second place in the first race, with Jonathan Stevens' J/97 Windjammer taking second in the final race of the day. Sigma 38 quatrosolutions Pandanova II took third in the first race, with fellow Sigma Mefisto finishing third in the final race. That leaves IRC 3's results table very close, with only 9 points separating 3rd and 10th place. All to play for next week! 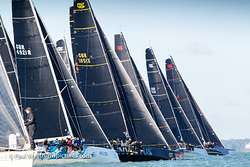 IRC 4 might contain the smallest boats but it has the biggest entry. It The 8-strong Impala fleet, racing within IRC 4 had a good showing this week, with Barney Smith's Imptish leading overall after scoring a 1st and a 3rd. Quarter Tonner Flashheart also scored 3, 1, with Giovanni Belgrano's classic Whooper scoring a consistent two second places. That leaves the fleet very much open after three races, with nine races still to sail. In the J/88 class, Kirsty and David Apthorp's J-Dream improved on last week's third place, scoring two firsts to take them straight to the top of the overall standings. Dirk van Beek's Sabriel Jr scored two second places, with Gavin Howe's Tigris banking two third places. Competitors swapped tall tales back at the HRSC clubhouse, where the day sponsor, The Bugle pub, was providing the prizes. This weeks' Top Dog prize - worked out as the boat with the best corrected time over distance sailed across all races of the day, went to Keith Mills' Invictus. 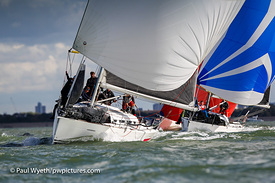 Three winners were recognised in this week's Best Start award: Sigma 38 Mefisto in IRC3, the J/70 Just4Play in the Hamble One Design Championships and Fast 40+ Class Zephyr in the Hamble Big Boat Championships. All took home a bottle provided by HRSC. 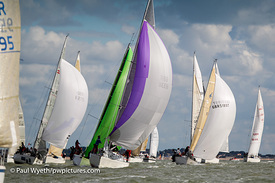 The J70s are a very competitive yet friendly class with 11 boats finishing within a minute in one race. The starts were equally competitive and in race 6 a sudden gust of wind at 30 seconds to go resulted in everybody being early and a general recall. 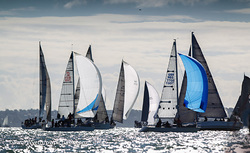 The prompt use of the U flag brought the fleet back under control, and for race 7 the competitors were back to their normal good behaviour. The competitors were undecided on which way to go on the beats and runs, with splits on every race. In race 1 everybody wanted to go uptide and so chose the right hand mark at the gate, but a quick tweak meant that the fleet were spread for the rest of the weekend. The course ended with a reach to the finish and with a building wind there were whoops of delight as the winners flew across the finish line. 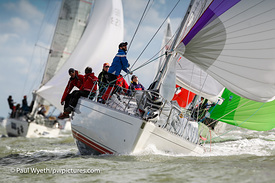 In the 12-strong J/70 class, 4 different boats took bullets – but after 7 races it's Mark Lees' Just4Sale that is topping the class, a healthy eight points clear of two boats. Patrick Liardet's Cosmic and Simon Cavey's Just4Play are tied on points, with Cosmic just edging ahead on countback – which should ensure some close racing in the second half of the Championships in two weeks' time. 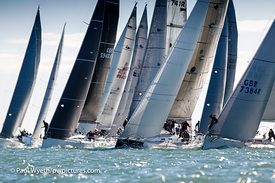 The 8-boat J/80 fleet also had a good weekend of sailing. 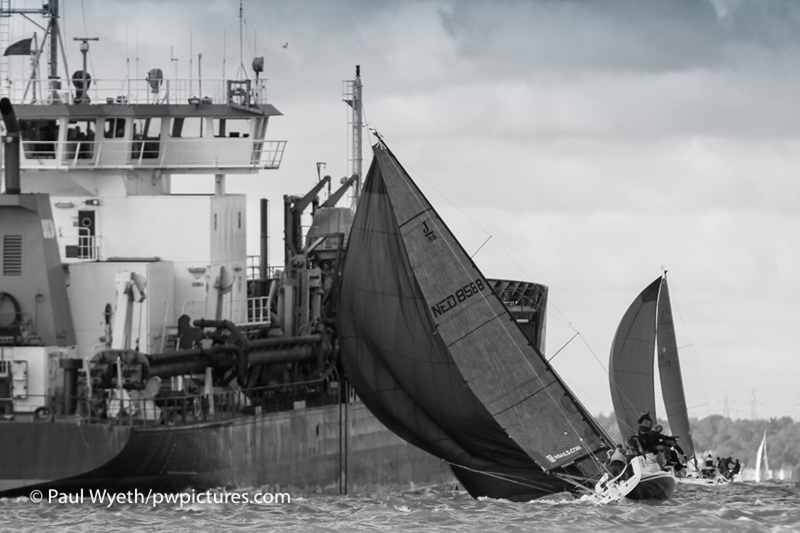 At this halfway stage, the class is currently being led by Jon Powell's Betty - a stalwart from the fleet. But they didn't have it all their own way. Bullets were also recorded by Aqua J, owned by Terence O'Neil, and currently 2nd overall, and Michael Lewis' Jester, currently 3rd – and it remains to be seen if they can push Betty off the top spot in next weekend's racing. 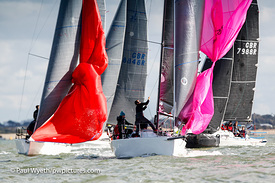 The first of two weekends of racing in the Hamble Big Boat Championships kicked off this weekend – and as well as featuring racing for IRC 1, this year's Championships also played host to the ten-strong Fast 40+ class, completing the fifth and final round of the fast-growing class' inaugural race series. At the end of the weekend's six races, it was Keith Mills' Invictus that clinched the event, ahead of Peter Morton's Girls on Film and Dennis Gehrlein's Silva Neo. IRC 1 also saw some extremely close racing, with boats switching positions all around the race course. 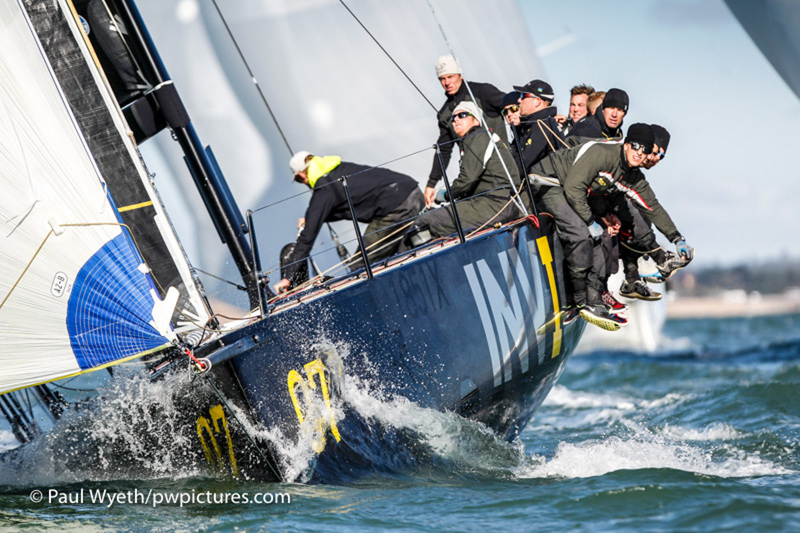 After 6 races, it was Nifty, Roger Bowden's King 40, that sits atop the leaderboard, four points clear of second-placed Kestrel, Simon Bamford's J/111. 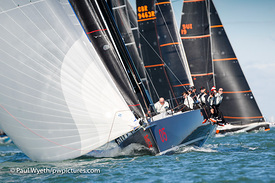 Ed Broadway's Ker 40, Hooligan VII, completes the podium at this halfway point in the series. 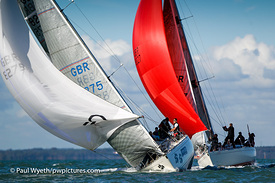 The Hamble Big Boat Championships and Hamble One Design Championships resume again on 22/23 October when these close-matched and top-flight sailors will continue their battle for the podium.